Welcome to deploying your PyTorch model on Algorithmia! This guide is designed as an introduction to deploying a PyTorch model and publishing an algorithm even if you’ve never used Algorithmia before. Saving and loading models in Pytorch can get tedious, because it requires keeping a copy of your source class code for any models you want to load again. The team at Algorithmia created a module for Python that sidesteps this process, along with a few other optimizations. For more information, check out the GitHub repo here. 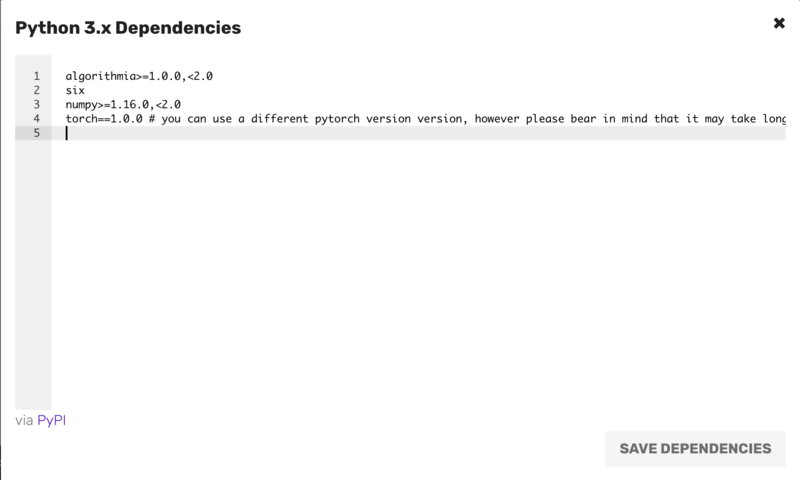 Install the ergo-pytorch package using Pypi with pip install ergo-pytorch==1.1.1. Import the base module with import ergonomics, or a specific module with from ergonomics import model_ergonomics. Instead of using Pytorch’s built in model.save() functionality, use ergonomics.model_ergonomics.save_portable(source_path). This will save your model along with the class code, so you don’t need to copy and paste that later on. Next, upload your pickled model to your newly created data collection. If you’re using the CPU implementation of Pytorch, you can add torch directly to the dependencies. If you’re using a GPU version, you’ll need to use our customized .whl file. You can find it here, and read about it in more detail on the ergo-pytorch repo. Pytorch offers a few different distributions for download that are split by CPU and GPU. The Pytorch files for CPU usage are normal sized, but when using the GPU packages the files can get very large. For GPU based implementations we’ve created a workaround that loads the files much faster than the default. When using the workaround, the main file stays the same (see example hosted model below) but you’ll need to create an extra file that executes the workaround. See the second example implement.py for how to do this. to predict labels for labels in the CIFAR-10 dataset. An example of how to speed up execution of your main code file. If you run into any problems or need help, don’t hesitate to reach out to our team! If you would like to check this demo out on the platform you can find it here: Pytorch CNN Demo. That’s it for hosting your Pytorch model on Algorithmia!